I mentioned a few weeks ago what a mistake it was for the Twilight filmmakers to follow author Stephenie Meyer’s New Moon novel too closely and for losing their minds for having Edward go awol for much of the Twilight sequel: The Twilight Saga: New Moon. I mean, hello? Why was Twilight such a huge success? Exactly. So here you go, the LA Times says the movie suffers because of the lack of Edward and his full on love for Bella. What a shocker. Christ, I’m not even a teenage gal but this is what the gals want so what were the money grubbing filmmakers thinking? Not that this will effect ticket sales. 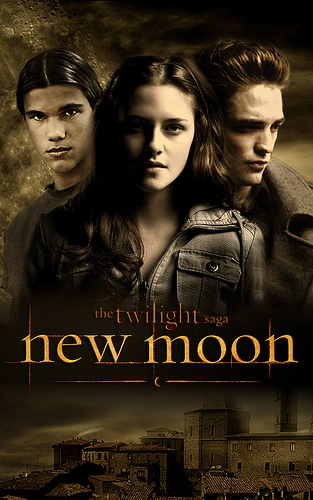 The Twilight Saga: New Moon has sold the highest pre sales tickets in American history. Teenage heart throbs only come once in a generation, so please, put Edward in the picture. It is also sad to hear from Indiewire that the gals and women who backed Twilight will be left in the cold once more as another movie for the boys gets churned out. It happens all the time of course but this time it makes no sense when female fans proved to be the force behind Twilight’s success. And with Mr. Pattinson as THE heartthrob phenomena of more than a decade (he’s the real deal. e.g. John Travolta and Grease), producers choose to ignore and milk it. But none of this matters. These films are huge and the next one will be huge -the fan base is there, the PR is massive. Us gals get let down again -it’s like another bad date. Man of the moment, Robert Pattinson’s new indie movie How To Be has already sold out in numerous festival circuits across the country since the movies release this week. For the filmmakers at least, it has attracted unprecedented attention that may not have been forthcoming without Pattinson’s pied piper charms on America’s teenage girls and boys. The soundtrack tie-in that has Pattinson performing three songs, features two fold-out posters of the teen-throb himself. I can hear the girls screaming and the cash registers clinking. This fall was privy to Hollywood firsts and Hollywood backstabbing at its finest with director Catherine Hardwicke ‘s teen phenomenon, ‘Twilight,’ grossing $70 million at the box office in its first weekend and welcoming Hardwicke as the first woman director ever to dominate Hollywood with such a high return. Stephanie Meyer’s adapted first novel had already grossed more than $160 million dollars in its first few weeks and Hardwicke was touted as the industry insider to finally shift Hollywood from its paternal hands of testosterone theatre, (the same Hollywood who had recently declared Nicole Kidman as box office poison because she is a woman), and proved that teenage girls, once forgotten, were a viable and lucrative audience. But Twilight’s producers, Summit Entertainment, fired Hardwicke mid-promo junket, demanding the second installment of the franchise to begin principle filming in the New Year; Hardwicke wasn’t ready. When a director makes a movie for $40 million and that movie grosses more than four times that amount in its initial release, it’s not often the director is fired. It seems Hollywood is ready for a black male president but not yet ready to trust the keys of the city to its creative women.